Danish death metal stalwarts Panzerchrist have been around since 1993 without making a particular splash, which isn't usually a mark of an interesting band. Still, the more you research them, the more interesting they become. Bassist/keyboardist Michael Enevoldsen started out as the band's drummer, taking up keyboards and his current bass duties over the years. The rest of the members are a revolving door, the current lineup consisting of guitarist Nils Petersen, drummer Simon Schilling (Streams of Blood, ex-Fleshcrawl) and vocalist Søren Lønne (once of Exmortem). Not exactly A-list, but a respectable B-list, and once you actually listen to 7th Offensive (the band's seventh full-length, as if it needed to be said) the respect grows. The obvious comparison would be to Bolt Thrower, although Panzerchrist are a little more melodic than the British bruisers. European death metal can often be more melodic without sacrificing heaviness, and the various batterings that 7th Offensive provides more than live up to the band's war-obsessed themes. The opening title track is ominous, pounding death metal heaviness with a widdly lead guitar providing some grandiosity, the whole thing acting as not so much an intro as more of a foretaste of the album. Foreign Fields then storms in, born aloft on a wave of lead guitar and sounding all the better for it as it leads into a melodic Carcassian surge. Despite this essentially being war metal there's actually a fair amount of variety, from the epic, almost Amon Amarthic Mass Attack of the Lychantrope Legion to the blunt and almost demo-quality Dogger Dead, a grinding, pounding Cannibal Corpse-esque gruntathon. On initial listens I wondered if this was a collection at first, rather than an actual album! Not that the variety is so great as to stop the album feeling cohesive; on the contrary, the tracks go together well and are kept in theme thanks to the war setting and general heaviness, and especially the aforementioned title track and the eerie Pig Parade that open and close the album expertly. Galloping blasters like In The Name of Massacration and the groovy Kill for Revenge with its nicely technical breakdown are good, solid death metal tracks, yet neither are alike apart from sharing heaviness and Nils Petersen's widdly guitar style. You ultimately have to give the guy a lot of credit, the frequent soloing giving 7th Offensive that extra bit of personality and making what is already a good collection of songs seem even better. 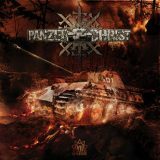 Not a revelation for death metal fans, but an enjoyable album that cements Panzerchrist as solid purveyors of the art of war.